I recently posted about the start of the campaign to get add-ons ready for the upcoming release of Firefox 3.1, and wanted to explain what our goals are and how we’ll be tracking progress. 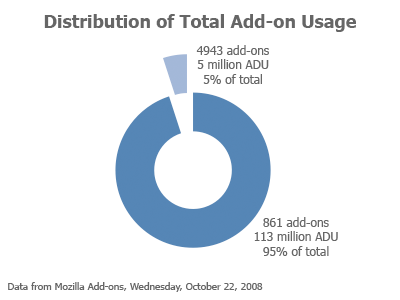 As with previous Firefox releases, we’re aiming to have 90% of add-ons that make up the top 95% of add-on usage compatible with Firefox 3.1. That’s not an easy goal to comprehend, so I’ll explain what it means and why we do it. Every day, the Mozilla Add-ons website gets around 135 million update checks from add-ons installed in Firefox and Thunderbird applications all over the world to determine if any updates are available. While there are some extensions that account for several million of those pings alone, there are many extensions that are not as popular and may have less than 100 active daily users. To make sure our outreach efforts benefit the most end users, we rank the add-ons by their number of active daily users and focus on helping the add-ons that make up 95% of the total add-on usage. As shown in the above graph, only 861 add-ons as of last Wednesday make up 95% of the total update pings, while 5% is accounted for by the much larger number of 4943 add-ons. 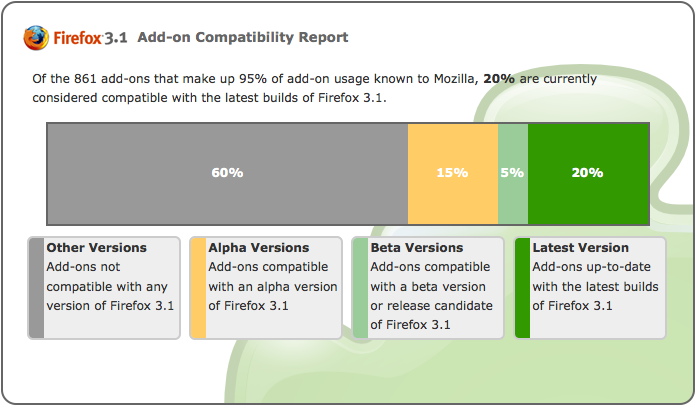 Our goal is to get 90% of these 861 add-ons compatible with Firefox 3.1. For the Firefox 3 effort (Operation Threedom), Alex Polvi created a status bar page that helped visualize our current progress. For 3.1, we’re taking it a step further and integrating a Compatibility Center within AMO that can always be checked for the latest progress. As shown, we currently have 20% compatibility. 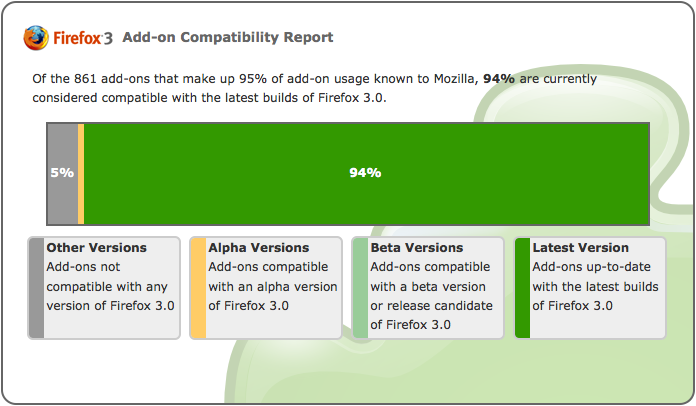 The report is customizable by version, so the current Firefox 3 version of the chart shows 94% compatibility. More screenshots and progress can be found in bug 460309. We’ll be posting periodic updates on the progress of the Firefox 3.1 compatibility push to the new Add-ons Blog and in various other add-on communication channels.